My family eats Butter Chicken fairly often. It’s one of my go-to recipes. 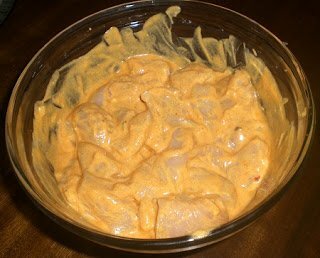 I enjoy using a premade sauce like VH’s Butter Chicken cooking sauce. It’s a quick and simple dinner that my family loves. You just sauté some chicken, add the sauce and simmer for a bit. Cook up some rice and you’re done. Given that my family loves to eat Butter Chicken, when I saw this recipe to make Butter Chicken Pizza I just knew I absolutely had to try it out. You can check out the original recipe on the VH Sauces website. 1. Stir together VH Butter Chicken Sauce, yogurt, and garlic. 2. Mix together 7 tbsp of the yogurt sauce with the chicken pieces; set aside remaining yogurt sauce. Cover and marinate chicken for 15 minutes. 3. Preheat oven to 400 degrees. Heat a dash of olive oil over medium heat (about a tsp). Add marinated chicken pieces; stir-fry until no longer pink inside; about 5 minutes. Remove chicken from heat. 5. Bake directly on oven rack for 6-8 minutes, or until cheese is melted and bubbling. Remove from oven and let sit for 2-3 minutes before serving. When I made this I followed the original pizza crust directions and cooked it at 425 degrees for 12 minutes. This does not work with Naan bread. I ended up with black, charred, Naan. I played around until I discovered that for Naan bread a good cooking time/temperature seems to be about 400 degrees for 6-8 minutes. My picky right-now-I-don’t-like-anything-with-any-spice-to-it five year old did complain that the sauce was too spicy. Next time I’ll probably add a bit of extra yogurt to her sauce before spreading it on her personal Naan pizza. I’m saying next time because I will most definitely be making this again! 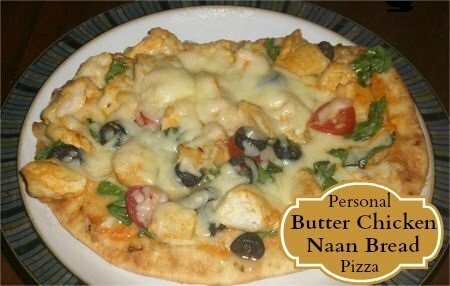 Once I got the proper cooking times down pat, I loved the whole idea of the personal Naan bread pizza so much! Adding yogurt to the Butter Chicken sauce made it just the right consistency for pizza sauce. One of the things that I liked most about turning Butter Chicken into a pizza rather then just serving it on a plate with rice, is that I was able to add vegetables to the dish. The kids of course LOVED getting to help create their own pizzas! I would never in a million years have thought this recipe up on my own. Thanks VH for adding a new favourite to my recipe box! If you’re looking for a little dinner time inspiration be sure to check out the VH Facebook page, where you can find plenty of great tips for adding fun and easy new twists to your everyday menu. Disclosure: I am participating in the VH Excite Your Dinner blog tour by enCompass Media on behalf of Con Agra Foods. I received compensation as a thank you for participating and for sharing my honest opinion. This recipe looks and sounds delicious and using it as a pizza crust must make the pizza taste even better.